From October 21st to 26th 2015 the NEOLA Team joined the “Reflection Group Istanbul” – a meeting for young curators and cultural managers on the occasion of the 14th Istanbul Biennial. The working meeting on contemporary art and cultural management of visual projects brought together participants from the Robert Bosch Cultural Managers Network, interested in the emerging art scene in Turkey, and established and upcoming experts from this cultural field. As NEOLA art projects we took part in the advisory and organizational team. Saliha Yavuz, our member based in Istanbul, designed a rich, exciting and colorful program for us. The Art Walk Istanbul (link: www.artwalkistanbul.com) lead us through the crowded streets of Istanbul, guided us to galleries, biennial venues and introduced us to artists, cultural workers and curators. We exchanged experiences and learned about the cultural field in Turkey. We discussed our thoughts of contemporary art, how to curate in dynamic societies and our ideas on managing cultural projects. The first day we discovered some of the most exciting spots, when it comes to art and culture, in between Tophane and Karaköy. As this year’s Biennial (curated by Carolyn Christov-Bakargiev) was shown in diverse public spaces spread all over the city, our exploration of the venues gave us unexpected insights to places such as an old and empty apartment building, the House Hotel, the Italian High School, the old Greek Primary School and an old garage in Tophane. To lie down on old matrasses in an abandoned, dilapidated house, watching the wooden ceiling, which was covered with mysterious signs, to listen to a sound collage in a wide, unused car port and an old library full with empty notebooks for stories to come: these were some of the highlights of this tour. Our talks at this spots with the artists Deniz Gül (www.denizgul.com), Cevdet Erek (www.cevdeterek.com) and Hera Büyüktaşçıyan (www.herabuyuktascian.blogspot.com.tr) were especially enriching and inspiring. Once in Tophane we visited DEPO (www.depoistanbul.net), a space for critical debate and cultural exchange and the first initiative in Turkey to focus on regional collaborations among Turkey and countries in the Caucasus, the Middle East and the Balkans. Besides having a stroll in the current exhibition “GRANDCHILDREN. New Geographies of Belonging” we discussed with the director Asena Günal and guest curator Silvina Der-Meguerditchian on curating in dynamic societies, cultural policy in Turkey and challenges in the cultural field in Turkey. After visiting the Biennial galleries such as Daire Gallery, Pg Art Gallery, Protocinema and Kasa Gallery were on our program. At Kasa Gallery we had the chance to meet and talk with the Derya Yücel (www.deryayucel.com), with whom we talked about her experiences and practice as curator. On our second day of touring in Istanbul again we visited biennial venues and some of the must-see galleries in Istanbul. We started the day by stopping by at the Pilot Gallery (www.pilotgalleri.com), which was currently showing a solo exhibition of Sener Özmen. Our gallery tour lead us to Galeri Nev, Zilberman Gallery, Sanatorium, Galerist and Pi Artworks, where we met among others the artist Volkan Aslan. In the top floor of a shopping center, located next to the Istiklal Street, we discovered the artistic world of Cansu Çakar. 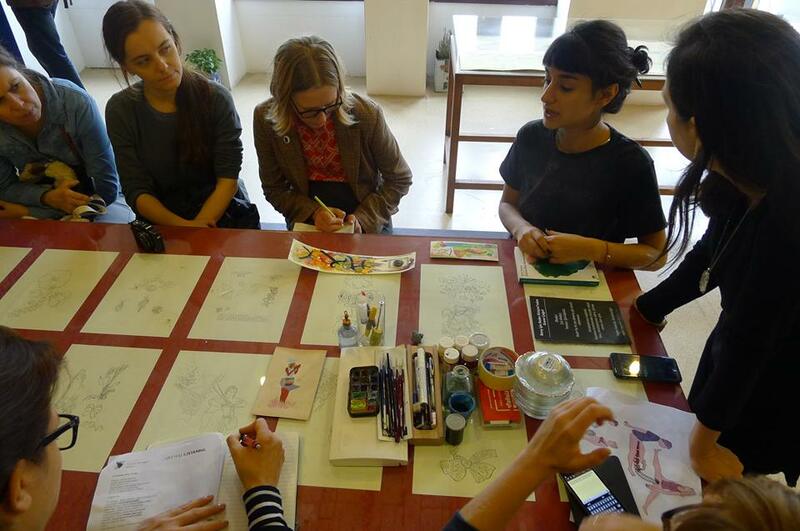 The artist used her biennial venue as exhibition and workshop space for her miniature painting sessions with women. In her workshop 100˚ the participants learned and shared how to express their experiences and struggles of being a women through the traditional style of illumination painting. The colorful and intimate drawings by the anonymous participants and Cansu´s works created an impressive kaleidoscope of expression in various styles. Moreover we visited the biennale exhibition at Arter, the Pera Museum, and an exciting exhibition about the political and cultural life in Turkey in the 80´s called “How did we get there? “ at SALT. After an intensive touring through the art world of Istanbul the 3rd day of our travel we focused on concentrated curatorial meetings and studio visits. At Kuad Gallery we met with Beral Madra to talk with her on the development of contemporary art in Turkey, the role of the Biennale and cultural politics in the latest years. Beral Madra, one of the key figures in recent art history in Turkey, gave us distinct and precious insights (www.beralmadra.net - www.kuadgallery.com). The artist Halil Altindere took us to a stroll around the old city. Through narrow, crowded streets he lead us towards his studio – thinking room – as he said, which is located in an old caravanserai. After enjoying the view of old Istanbul from the top of the building we chatted about arts and politics and his new book “Contemporary Art from Turkey – A user’s manual”. We “finished” our day (and us ;)) by visiting the main venue of the Istanbul Biennale at the Istanbul Modern. All in all besides getting enormous insights into the art world in Turkey the exchange between the network members, the artists and the curators, our discussions on common perspectives on contemporary art, mediation of art and our visions of curating and managing cultural projects were inspiring and enriching. With the hope and vision to start new collaborations soon….